Your products are made to withstand even the worst of weather conditions. We once heard a story from our customers about their Tropitone furniture holding up through a Kansas tornado- WOW! Even though your grills, furniture & umbrellas are strong, you can still take extra precautions to ensure a longer lifespan of your favorite pieces. After all, snow, sleet, wind and rain can deteriorate these items over time. The best thing you can do- cover it up! These covers come in a variety of shapes and sizes, made to fit even the biggest of furniture. Cover each piece individually or cover them all together! The possibilities are endless. When searching for the right grill cover, you have two options: a cover made specific for your grill or a cover with the correct measurments.The good news- we carry both! 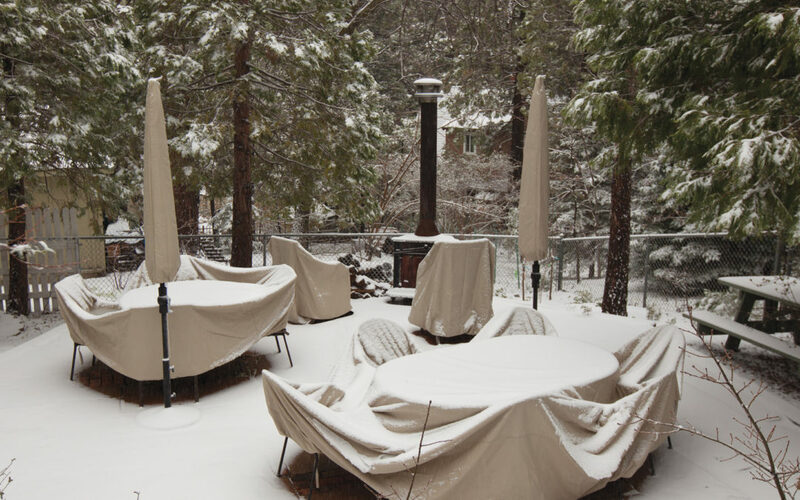 If you are the proud owner of a Primo grill, we recommend a grill specific cover. These ventilated covers are 100% weatherproof, protected against fading from UV rays, withstands even the coldest of temps, and are mildew and fungus free. These covers are made to fit your Primo+ the countertop table. Broil King also has it’s own brand of covers. These premium grill covers are water resistant. They feature a mesh venting for enhanced air flow and moisture resistance . The velcro closures ensures a superior fit for each specific model! Our line of GrillPro covers come in multiple sizes to fit multiple grills and smokers! These are made with a PEVA exterior making it water durable and fade resistant. These covers are known for a 4 season protection! Who knew even your umbrella could be protected!? These covers are made by Treasure Garden, a leader in the umbrella industry. Just like the furniture covers, these covers are made of rhinoweave, durable, breathable & water resistant. You’ve invested in these products. Protect your investments this winter for prolonged life!